Honduras has suspended an overnight curfew in eight departments after the areas were no longer considered a security risk following last month's disputed presidential election. The lifting of the curfew was one of the demands made by the Organisation of American States. The OAS said it may call for new elections if any "irregularities" undermined the credibility of results. Some parts of the country remain under curfew. It was imposed last weekend after outbreaks of violence followed the 26 November poll. 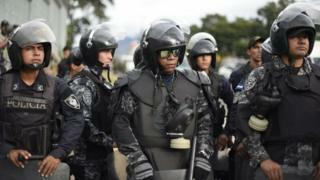 Honduras has 18 departments, but the curfew had already been lifted in one island department and two cities. In a statement on Wednesday, the OAS calls for constitutional rights to be "immediately restored". President Juan Orlando Hernández, who is seeking re-election, won the poll by a narrow margin. But the main opposition contender, Salvador Nasralla, demands a full recount. He accused the Supreme Electoral Tribunal of interfering in the tallying system to favour the incumbent. The OAS says that the electoral court must check a number of alleged irregularities before announcing a final result. "It is clear that it is not possible, without an exhaustive and meticulous process of verification that determines the existence or not of an electoral fraud to restore the confidence of the population," said the regional body. Mr Nasralla was leading the official count by five percentage points on the day after vote. But Mr Hernández began to narrow the gap on the second day of counting, after the electoral court stopped updating results for more than 24 hours. Angry protesters took to the streets, blocking roads and clashing with police. At least 11 people were killed in the violence, before the government imposed a night-time curfew last week. Mr Hernández eventually won by 1.6 percentage points. On Monday, however, hundreds of members of the Honduran riot police force known as Cobras refused to carry out orders to enforce the curfew. The head of the OAS observer mission, Jorge Quiroga, renewed calls for the Honduran authorities to carry out a wider rechecking of ballots. Electoral authorities counted about 6% of the votes again on Monday and agreed a day later to look at ballots from 5,173 polling stations - nearly a third of the total. OAS observers said that the problem had been "the ballots had not been transmitted on the night of the election, and a recount of tallies shows inconsistencies". The court has until 26 December to make a final announcement of the result.